Yasser is Head of Corporate and Commercial in our Abu Dhabi office. Over the years, Yasser has acquired an in depth knowledge of UAE law and has extensive experience advising clients on a wide spectrum of fields of the corporate and commercial laws including, distribution and agency agreements, supply contracts, manufacturing and licensing, joint ventures, media buying, and distribution of pharmaceutical products. 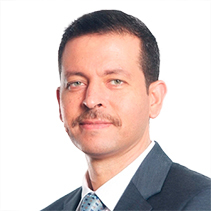 Before joining Hadef & Partners, Yasser worked for Shalakany Law Office in both their Egypt and Dubai offices. He completed an LL.B. from Ain Shams University and a Masters’ Degree in International Business Law from Cairo University in association with the University of Paris I Sorbonne. He has also completed International Practice Diplomas from the College of Law of England and Wales. Yasser has authored a range of articles and publications including the UAE chapter for International Agency, Distribution and Licensing Agreements, published by Sweet & Maxwell in 2008. He is fluent in Arabic and English and holds a professional certificate in legal translation from the American University in Cairo. Hadef & Partners is delighted to have gained recognition for recent deals winning two categories at the Middle East Legal Awards 2017.